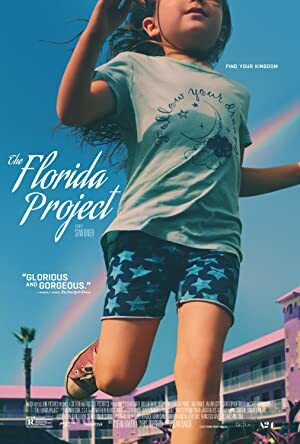 The Florida Project (2017) – What's New on Netflix Canada Today! Halley lives with her six year old daughter Moonee in a budget motel along one of the commercial strips catering to the Walt Disney World tourist clientele outside Orlando, Florida. Halley, who survives largely on welfare, has little respect for people, especially those who cross her, it an attitude that she has passed down to Moonee, who curses and gives the finger like her mother. Although the motel’s policy is not to allow long term rentals, Bobby, the motel manager, has made arrangements for people like Halley to live there while not undermining the policy as he realizes that many such tenants have no place to go otherwise. Halley, Moonee and Moonee’s friends, who live in the motel or others like it along the strip and who she often drags into her disruptive pranks, are often the bane of Bobby’s existence, but while dealing with whatever problem arises, Bobby has a soft spot especially for the children and thus, by association, their parents, as he knows that Moonee and others like her are just children acting like a children under whatever guidance they have, Moonee who has less guidance than most. Although there are some lines which he will not tolerate to be crossed, Bobby lets most of the disruptive things that they do go, largely as long as it does not affect the bread and butter of the motel, namely the tourist trade. The summer in this collective is presented, when Moonee and her friends, such as Scooty, are out of school and are left largely to their own devices while self-absorbed Halley does whatever she wants, often just staying in the room watching TV. Halley is supposed to look after Scooty, the son of Halley’s friend Ashley, they who live in the unit immediately underneath Halley and Moonee’s, while Ashley is at work at a local diner. In turn, Ashley pilfers cooked meals from the diner to feed Halley, Moonee and Scooty. Over the course of the summer, Halley systematically begins to alienate one by one the people who are her unofficial support by responding with that disrespect to anything she feels is against her. As such, Halley begins to take more and more extreme measures to maintain the life she leads with Moonee.